An ultra rich, non-greasy restorative facial moisturizer nourishes skin and provides antioxidant protection. For sensitive and dry to very dry skin. Revitalizes dull and lackluster skin by increasing skin's hydration and reducing dryness and flakiness. Replenishes skin with Ceramides, plant sterols and fatty acids. Apply AM/PM to face and neck after cleansing with Gentle Milk Cleanser and Gentle Toner. The skin on my neck is super-sensitive. It only takes a few days of using a product for "normal" skin for it to feel rough & look quite wrinkled. I've used Avene products before & ordered this because I know it is very mild. The rough area on my entire neck turned into soft & supple skin almost overnight. I am impressed! I loved the sunblock so I tried this cream and am using it as a daycream. I love how it absorbs really quickly but it stings my skin. I have sensitive skin and am on prescription retin-a. So I'm not sure if I'll continue to use this. I have sensitive combination skin that doesn't retain moisture. My T-zone is normal to slightly oily depending on the season, but my cheeks are always dry. Although my skin rarely breaks out, many moisturizers, sun screens, and make up cause problems. I have had difficulty finding a cream/lotion that helps my skin stay moist all day, particularly my cheeks, and that does not irritate my skin or cause blemishes. 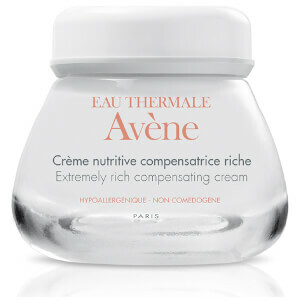 This past winter I received samples of Avene Ultra Rich Compensating cream and liked it so much I ordered a jar. It made the dry irritated patches go away, kept my skin moist all day (even in 15 degree weather), didn't cause blemishes, made my wrinkles less noticeable, and was gentle enough to use around my eyes. It also costs half the price of what I was using and works better. Now that spring has arrived, I find it still works for me - I just use a little less. Over the years, I've tried many products, but never found one that works as well as this one. I use it with Skinceuticals CE Ferulic and my skin glows even without make-up. I am thrilled to have finally found a cream that works for my sensitive, reactive, and dry skin that doesn't cause breakouts on my T-zone. My Mom is using now too. I am currently using Retin-A (0.05%) and as a result my normal skin has become very dry. I received this as a sample from skinstore and I noticed an improvement instantly. I just bought the full-sized product and I am really happy. It is a great moisturizer without being heavy or greasy. The light smell is very pleasant and not overwhelming. And my skin is not dry and flaky anymore (which is a typical condition for Retin-A users). And I think it is a great value for the money. Overall this ia a great moisturizer for those that have really dry skin. I'm so glad I tried this! I mix up which products I use: Strivection, this, La Mer, Autopalm, etc. Anyway, this doesn't have any anti-aging benefits other than moisture, but I find I need moisture sometimes and this is perfect. No breakouts (and I'm breakout prone)! I MUCH prefer it to La Mer (I never thought I'd say that); it sinks in. So soothing. Love it! This is the best moisturizing cream I have tried in a long time. It's excellent for super dry skin and absorbs quickly. I received it as a sample with my order and was instantly hooked. Smells great to!